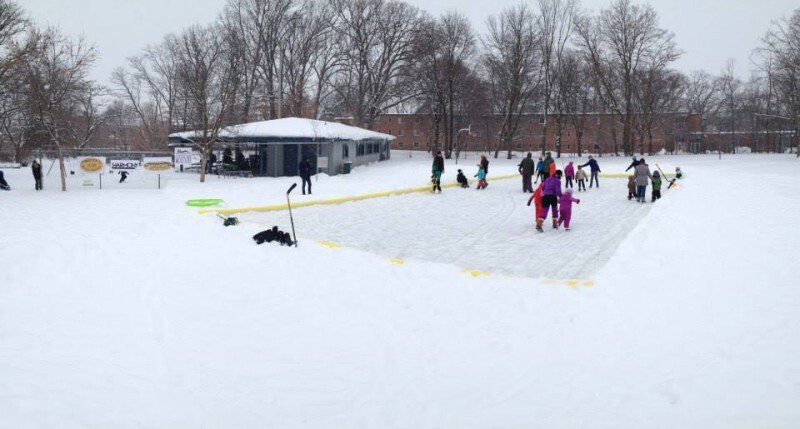 Richmond Park and Wilcox Park were both host to three great events this past weekend that brought the community together to celebrate winter and enjoy reconnecting with neighbors during a time of year where it’s more comfortable to sit inside under a warm blanket. On Saturday morning, hockey teams took to the ice at Richmond Park to participate in the 3 on 3 Hockey Tournament sponsored by Open Systems Technologies. The Hockey Tournament was part of the annual WinterWest event organized by Friends of Grand Rapids Parks in partnership with the City of GR Parks & Rec., and WelcomeWest. The tournament was played with 20 minute games, no goalies, and small slot goals to encourage puck handling. After 4 hours of intense and tiring games, the Grand Rapids Bandits remained undefeated all day and were crowned tournament champions. 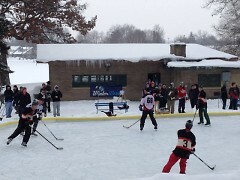 Later that afternoon, neighbors around Wilcox Park organized a pizza party and open skate on their ice rink. The shelter was open so neighbors could warm up with hot chocolate from Lantern Coffee Bar and Lounge and pizza from Harmony Brewing Co. Kids and adults took to the ice for pick up games of hockey, tag, and loops around the ice. For many kids it was their first time on ice skates, and many adults had not been on skates in many years. Neighbor Rick Beerhorst put it best when he said, “This is the most fun I’ve ever had at Wilcox Park!” Volunteers from the Eastown Community Association have been helping to clear the ice of snow and to keep the rink in good condition for skating. On Sunday afternoon, over 50 participants crafted cardboard and duct tape into winning designs for the Crazy Cardboard Sled Competition at Richmond Park. Corrigan Moving Systems provided cardboard, tape, and sled building classes right before the race for last minute entries. This special event was part of WinterWest and was sponsored by Grand Rapids Public Schools. Local elementary schools, like Coit Creative Arts Academy, took part in the event along with residents from all across the city. 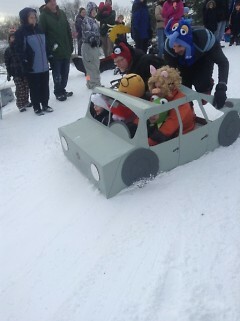 The sled competition had two prize categories, longest distance traveled and most creative design. The distance category winner was a sled piloted by Gage Klocko, 11, and Jacob Crinion, 12, and the best design was awarded to DeGraaf family for their Muppet car. Winners received Griffins Tickets, apparel from Michigan Awesome, bowling passes from Wengers, and a new sled. Park visitors were able to warm up at the Richmond shelter all day with hot chocolate and coffee.